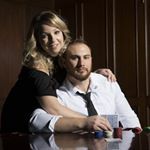 When social media connected up-and-coming solo artists Leanne Weiss and Derek Allan, there was instant musical chemistry. After relocating to New Jersey from Pittsburgh, Allan reached out to local singer Weiss about collaborating on writing country music. After a few songwriting sessions, recording a cover video, and playing at a county fair together, the two decided to join forces and form the duo October Rose. Since their formation in October 2016, October Rose has been a force to be reckoned with on the New York City country music scene. With featured appearances on Ty, Kelly and Chuck’s “10 Minute Tune” and opening slots for Drew Baldridge, Russell Dickerson, Jordan Davis, and Sara Evans, this duo is gaining momentum. October Rose has incorporated their love of 80’s hair metal and classic country into their songwriting. With a modern country sound that is truly unique, this country duo is ready to show off their vocal stylings on their debut EP, “All In,” to be released in Spring 2018.